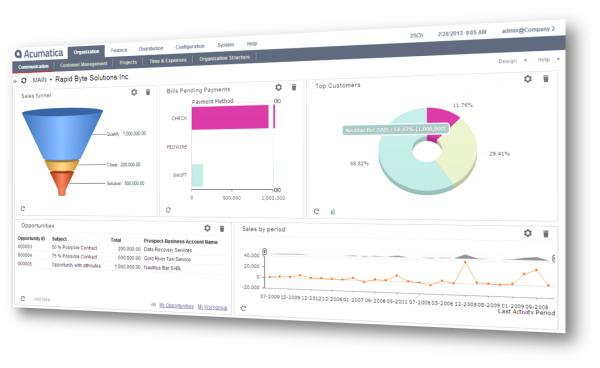 The Acumatica Sales Order Management Suite is an add-on module to the Distribution Management Suite for managing the complexities of sales orders such as entering quotes, fulfilling sales orders, creating shipments, tracking prices, applying discounts, and checking available inventory. Automate order processing and eliminate unnecessary steps with Acumatica integrated workflow. Configure order status, status changes, actions, notifications and alters to automatically trigger during order processing. Predefine Order Types tied to specific order processing requirements. Specify inventory allocation rules, workflow scenario, and the documents that will be generated in the accounts receivable and inventory modules. Manage complex pricing and discount policies. Set up quantity and volume discounts as a percent or an amount. Specify multiple discount rules and sequences or allow the system to automatically apply the best discount combination. Maintain discounts in single and multiple currencies. Establish rules and policies for price overrides. Download the Sales Order Management Suite PDF spec sheet to learn more!